In this type of work we are connecting with our deeper/higher selves while in a deep meditation (known as journey). I will safely guide you into journeys where you can connect with your inner healer, higher power, spirit guides, and power animals. In these journeys, you will receive messages and healing that can be highly profound and transformative. This modality has helped individuals who have been feeling stuck emotionally and spiritually. This is a tool you can practice on your own for continued benefits. 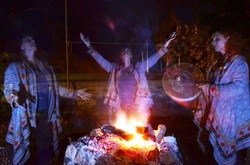 Shamanic healing includes soul retrievals and extractions. When one has been traumatized, or abused, a part of the soul may split off. Soul loss can play a big factor in feelings of isolation, depression, emptiness. A soul retrieval is an ancient sacred ritual performed by the shaman to recover and return the fragmented parts of the soul. A soul retrieval can produce feelings of wholeness, lightness, increased energy. You may even begin to remember some of your innate gifts and talents. Extractions: extractions are the removal of misplaced energy. A shaman will go into an altered state, then scan your spirit body for any energies that don't belong to you or aren't serving you in a positive way. Misplaced energy can come from different places. It can be an energy sent to you by someone or it can also be your own negative feeling which you have buried in your body rather than expressed. Extractions are a very powerful tool. Many people will feel lighter and have much more energy after a session. Chakras are energy centers in and around our body. When getting a chakra healing, I will scan your chakra centers and explore where there might be imbalances in the circulation of energy. Then through the use of stones and oils we will work together to balance the chakra energy centers. Some people experience a feeling of deep connection and sense of well being after a treatment. I feel that if you are even curious about this line of work, then it probably has something to offer you that you may not even be aware of. These sessions are usually about 60-90 minutes long, and initially preferably done once a week or every other week. Fees for these sessions are $150 per hour, $200 for an hour and a half.